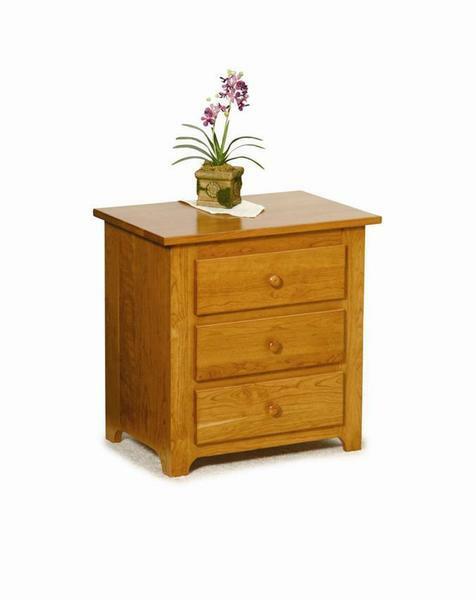 Crafting furniture with a focus solely on function has lead the Shaker style pieces to remain popular for decades. Clean lines, simple curves, and general beauty brought on from the bold grain patterns in the hardwood are the staples of a Shaker inspired decor. Our Three Drawer Shaker Nightstand embodies this style of furniture artistry, offering a truly antique look that you can incorporate into any bedroom suite. The large top is perfect for keeping your most needed bedside items, from your lamp to a bouquet of flowers, and anything in between. Below, large solid sides lead around to the three main drawers in front - each one opening completely to allow access to all of the items inside. A firm push and the smooth motion of the ball-bearing slides allow the drawer to engage the soft close mechanism, which will take over and offer a complete and silent close, every time. With a nightstand from DutchCrafters, you choose the hardwood, stain, and hardware options to craft a nightstand for any decor. Choose from a wide array of wood and stain combinations and finish it off with the standard hardware, as shown, or choose another piece to suit your tastes.